22 years ago, we went on a top-secret mission to discover techno-minded galaxies. We flew through a dark hole, thousands of solar systems and two milky ways. We knew no extraterrestrial spacecraft ever went this far before! As soon as we got closer to this alien world called “planet earth” something mysterious happened. We sensed that this atmosphere was similar to ours. As we were reading the signals, we found out that the music frequencies and sonic spectrum were the same as on our asteroid. From that moment, we realized humans identify themselves with our culture and share the same value of respect and love for techno music. That’s why planet earth is, and always will be, our favorite sphere. Therefore we invite all humans to our big 22nd birthday bang. We will present you a fresh techno line-up with artists that are both musically exciting and hot. We venture away from the known paths and will present music that represents the true underground techno spirit. We have also booked a lot of local talent on this anniversary line-up because we feel the level of quality on planet earth is so high that we could not resist on promoting and distributing it. We will be blowing you away in two galaxies which will both be exciting and stimulating to body, mind and soul. DS7 is headed by Speedy J who is unanimously considered to be one of the first techno producers to come from the Benelux. Together with people like Laurent Garnier, Aphex Twin and Richie Hawtin, he played his part in raising the genre just after it had escaped the Detroit delivery room. Since the early nineties, Speedy J releases on labels like Plus 8, Warp and Novamute. After fifteen years of techno Speedy J became full circle as Electric Deluxe: a record label and platform for artists, operating within any conceivable genre in the broad spectrum of techno, who wish to fully explore and embrace the ever-expanding technological possibilities. German electronic trio Fjaak produce driving, energetic dance tracks which range from reflective deep house to storming warehouse techno. Gritty yet sensual, their tracks are composed entirely on analog equipment. Following releases for Klasse and Baalsaal, they signed to Modeselektor's 50 Weapons imprint and released several 12" singles, including a split release with Rødhåd. When 50 Weapons folded in 2015, Fjaak moved to Modeselektor's main label, Monkeytown with their self-titled debut full-length in early 2017. Charles Duff, also known as Matrixxman, has been busy soundtracking the technological singularity that unfolds before us. His sound tends to be cold and mechanised yet somehow retains an element of warmth, perhaps even soul, if you will. He creates a lone spark of instantiated humanity that refuses to be extinguished by the din of automata marching toward us. After a steady output of EPs on labels like Dekmantel, Planet Rhythm, and Delft, he released his first full-length album on Ghostly International. UVB is the pseudonym of the French DJ and producer Sébastien Michel who started concentrating on his techno project by developing his own version of a live, a set only composed of his own productions and played out at clubs in Berlin (Urban Spree, Tresor). In 2014, he released is first EP on the Rotterdam based label MORD, followed by the double pack “Second Life”, both supported by some of the biggest names in the techno scene such as Surgeon, Marcel Dettmann, Tommy Four Seven.. At the moment, UVB is working on new music for the launch of his own label “Body Theory” and delivers his own vision of techno on numerous gigs he around the world. Spacid has a colorful 26 years of dj-ing experience. And it shows! Spacid played at an impressive amount of clubs, parties and festivals in and out of the country. Both his reverence for the past and his quest for innovation transpire in his work as a dj. His thirst for renewal is illuminated by his passion for music, which keeps him sharp. He’s been a Kozzmozz resident for many years and knows the crowd like no other. Border One crafts a unique journey throughout his productions: exploring the borders of his self-consciousness spectrum through sound, perception and melancholy. This gifted musician dropped his first EP “Bitterscharp” in 2015 on Wolfskuil Records. Immediately gaining heavy support by Token boss Kr!z and Ben Klock and resulting in gigs at famous clubs and events. His strong debut was soon followed by outings on Stockholm Ltd, the legendary label from Pär Grindvik, and Ressort Imprint. In a world that’s surrounded by dark clouds and uncertainty Border One shines a bright light upon us as he emerges from the shadows of the vaults. On DS9 we are very honored to welcome Peter Van Hoesen who has never been that typical techno artist. Although considered as one of the genre's tastemakers he is someone who sculpts sounds for many different environments. He does so with a true sense of personality. On his own label “Time to Express” he releases textural compositions and he also records to great acclaim as Sendai alongside Yves de Mey. In performance terms, Peter lays down dark and arresting techno sets as well as captivating, storytelling live musical journeys. Because of that he is renowned around the world. Harnessing telluric currents that flow deep under a hypnotic pulse A. Brehme symbiotically combines his two long-standing passions of producing records and sculpting intense sets, which are grounded from the ambient, psychedelic and minimalist perspective of electronic music. Whether elaborating a savant strain of hypersensitive deep techno in his Brussels studio or displaying his ability to kick up a veil of dust from the floors of dark rooms with metrically repetitive mixes, he embodies a purist approach to sound where measured intensity is key to reaching a form of higher awareness. When experiencing a performance by A. Brehme, either as a resident at the thriving Technoon parties in Brussels or in an international context, the mind begins searching for loopholes within loops, seeking out a tear in a tightly knit ambient soundscape that is rendered tangible by lengthened hypnosis, thoughtful control, and the eventual loss of all spatial and temporal coordinates. Trish is one of the few if not one of the only female dj’s who actually uses 3 turntables for mixing. This skill, her energetic play, mixing tunes to create new ones, cutting, using her own edits as well as her love for Detroit and futuristic inspired music, helped her create her own sound and she will not leave you untouched… And yet good is not good enough…. Always exploring for new ways, always looking for new challenges, new inspiration, looking for the never ending future, techniques and sounds, her restless journey keeps on going…. With Electric Art Recordings and her monthly ‘Electric Room’ parties at the legendary Fuse Club she continued her mission of bringing electrifying grooves to the dance-floor. Besides being a well known face in the party scene of Belgium – working behind the scenes for Liberty White, Audioviolence and Partybus – TRiXY quickly gained momentum playing the darker Underground Techno scene in the west of Belgium. Together with some of her closest friends who share the same passion for music, she started ‘Lab.105dB’ and got booked on several big events as Chronicles, Rave Cave Tomorrowland, Lost Theory (HR), to name a few. She is now a resident at Decadance Ghent where she was able to grow even more and perfect her skills and style. ABSURD are two very talented electronic musicians who had been freestyle jamming in small attics and dark basements for years, just having fun on their machines. Until they participated in the annual Extrema Outdoor Belgium producer contest and won. Since that day they have been preparing themselves to show their mad skills to the rest of the world! Their own stage at Extrema Noir hit the bulls-eye when well-respected international producers were blown away by their performance. Now the time has come for the rest of the world to meet…ABSURD! 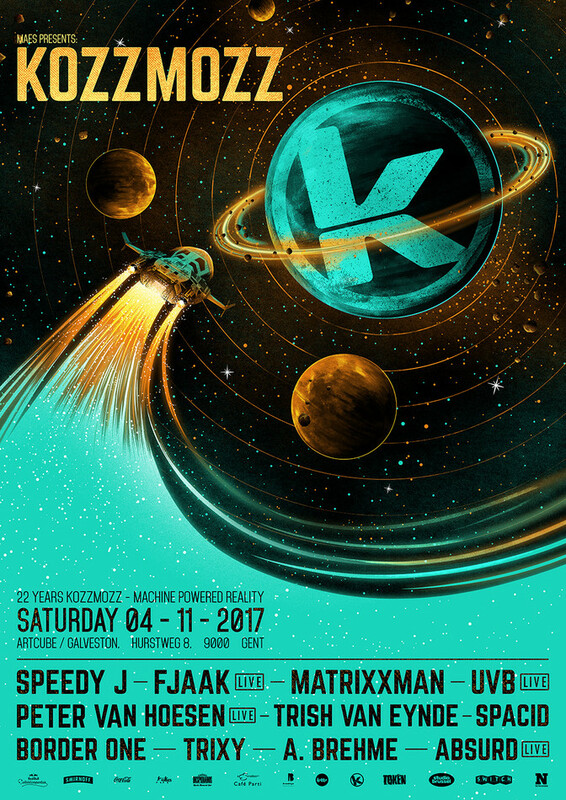 Come and fly away with us to celebrate 22 years of journeying through all the realms of techno, exploring so many galaxies and so many spheres!